Last week I noticed a blister on Hudson’s paw and he’s been sidelined since. Just as in people it’s not an uncommon occurrence but in all of the miles we’ve logged together, not one we’ve ever encountered before. Perhaps it was a jagged stone, or a thorn from the wild strawberry bushes that abut the backroads we travel, or a shard from a discarded bottle that caused it but it’s healed now and tomorrow Hudson will rejoin the ranks and our pack is back again. … is the question. There are many many mitigating factors for an answer but for me, it’s three. (1) Breed. Some do better with footwear than others and some are better suited than others. With double hind dew claws – Pyrs aren’t. Plus, dogs in general just don’t like them. (2) Trail conditions. Some situations necessitate them, surely, as Hudson and Murphy wore them many many miles on our first walk. And (3) Temperature. The weather has been favorable for us since we first left the border May 10th barely reaching above 70 during the day but it’s on the rise which is why we try to reach our daily goals before noon time before the ambient temperature of the sun has yet to heat up the pavement significantly. Hudson has always had ‘soft paws’. It’s part of his charm. Can’t wait to have him rejoin us on the trail tomorrow as we have 10 miles to Tacoma. 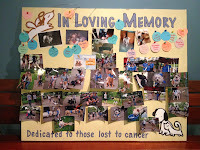 It’s great to be back on the road again educating and raising awareness of cancer in pets and people and promoting the cause that we all so passionately believe in. 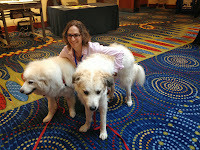 Two weeks ago, the Fuzzybutts and I drove from Newport RI, crossed the Berkshires, transversed upstate NY on into Erie and Northern PA, down to 80/90 to the Twin Cities to get to the Veterinary Cancer Society Conference in Minneapolis. From there our travels took us to Des Moines IA onto to Madison WI then horseshoed up to Grand Rapids MI and did a slingshot around Ann Arbor MI back to the Chicago area for the upcoming Puppy Up! Walk next Saturday, the 2nd. The only reason I bring up geography is that, when added to the 12,000 plus miles of the Summer of Murphy Tour last year, the Murphy Mobile has pretty much circumnavigated the Continental US, except for a few swaths here and there. Next blog… ‘This Is’ – Pics from our travels!